On May 30, a Japanese research team videotaped a one-meter long coelacanth in its natural habitat in the waters off the coast of Indonesia's Sulawesi island. According to the announcement by Aquamarine Fukushima -- a marine science museum located in Fukushima prefecture -- this is the first video of a coelacanth in its Indonesian habitat since a German team videotaped one in 1999. Researchers at Aquamarine have been studying the coelacanth since the facility opened in 2000, and a research team has been stationed in Indonesia since last year. 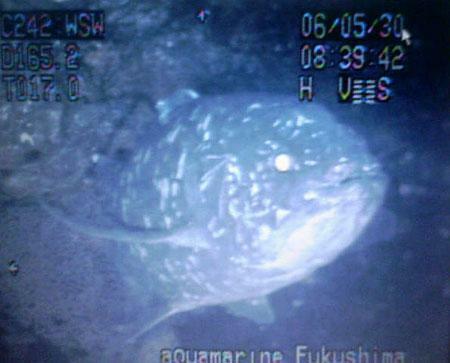 Researchers used a camera mounted on a remotely operated vehicle (ROV) to shoot a 10-minute video of the coelacanth. The video reportedly shows the fish lurking in a rocky cave located about 500 meters off the coast of Buol in northern Sulawesi, at a depth of about 170 meters. The museum has not indicated when the video will be shown to the public. "The camera light caused the fish's eyes to glow green. It was there. Its body was dark blue," the research team reported to museum director Yoshitaka Abe on the telephone. "Congratulations. Well done," Abe told the researchers. "This is a big first step in our research." UPDATE (June 2, 2006): This translation was referenced by Loren Coleman on Cryptomundo, where you can find a lot of interesting background info about the coelacanth. He also discusses the potential significance of the reported "dark blue" color of the one caught on this video (Latimeria menadoensis, the Indonesian species, is supposed to be brown). The German team that first filmed the coelacanth in Indonesia in 1999 was led by one Hans Fricke (See: http://www.dinofish.com/jago.html). I could not find his video of the Indonesian coelacanth online, but I came across these fantastic videos he shot of the African species (Latimeria chalumnae). In one of them, a coelacanth displays its trademark "handstand" posture. The Indonesian coelacanth Latimeria menadoensis is NOT brown! They are blue colored, same as the Comoro coelacanth. They all get the brown color when they are out of the water for a longer time.